By now, you probably already know that we’re huge fans of the food blog Half Baked Harvest. Whenever we’re on the hunt for seasonally inspired, fresh, healthy, creative, and approachable recipes to try, this is one of the first places we look. Not only do all the featured dishes look as good as they taste, but the recipes are also written in a super-accessible, easy-to-follow manner so we can cook them at home. As such huge fans, we were incredibly excited to interview the woman behind the blog, Tieghan Gerard, about her gorgeous, renovated workspace, her career advice, and her cooking tips. 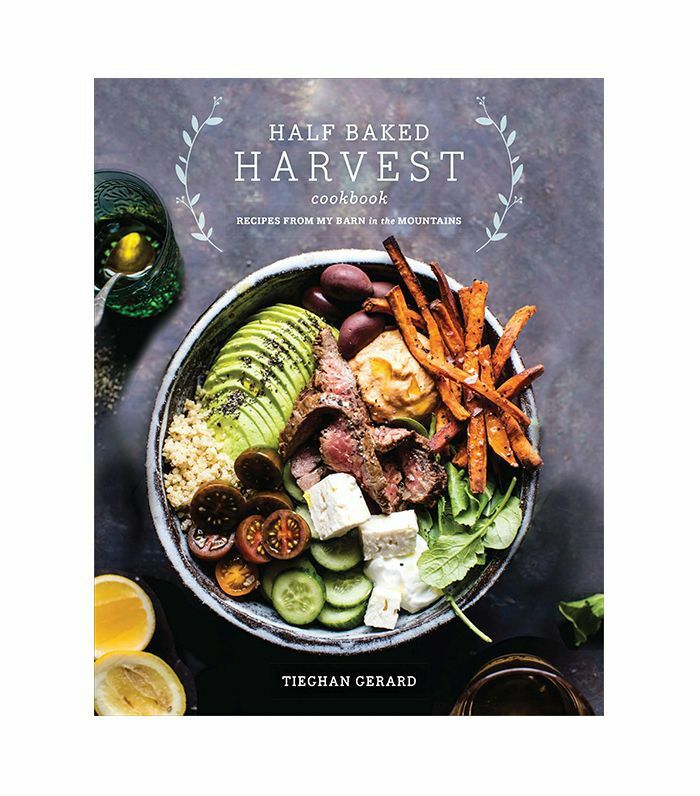 And perhaps even more exciting, she also released her first cookbook today—the Half Baked Harvest Cookbook. Before you cook your way through the whole thing, read through our conversation below to hear how she’s grown her food blog into a business, what items she always has in her pantry for an easy and delicious weeknight meal, her favorite fall recipes to try at home, and get a peek inside her gorgeous digs. MYDOMAINE: Tell us a little bit about the concept and process behind your work space. TIEGHAN GERARD: A couple of years of ago, I began renovations on an old horse barn. The idea for the space was to be both a living and working space for me and my growing business. I scoured Pinterest for inspiration and envisioned a bright and cozy farm-style house. The downstairs is almost fully dedicated to the kitchen and pantry. For the kitchen, I wanted it to have a classic but rustic feel. I went with marble for my counters and backsplash, open cabinets, a large farm-style copper sink (which I love), and durable concrete floors. In an effort to warm up the space and make it more inviting, I finished the walls surrounding the kitchen in reclaimed barn wood. MD: Did you have any driving design goals or visions while renovating the barn? TG: The vision behind the space was pretty simple; I needed a working kitchen with a large pantry and plenty of large windows to let in light for photography and video. My goal was not only to create an inspiring space, but it was also to create a cozy space for me to live in. MD: So what’s your favorite part? TG: My favorite space is the kitchen. It’s a dream kitchen, and I feel so lucky when I am working in it. I designed the kitchen for functionality, and I feel like it is one of the best working kitchens out there. MD: You’re obviously passionate about what you do. What’s your relationship with food and sharing meals? Is there one aspect of cooking that feels the most meaningful? TG: For me, cooking is about creating a meal that makes someone happy. I’ve always loved the reaction on friends’ and family members’ faces when I serve them a meal they love. It’s honestly one of the main reasons I cook; I just love being able to make people happy through food. MD: Do you have any advice on how to turn your passion into a career? TG: I always answer this question by saying work harder than anyone else. You have to hustle in order to turn your passion into a career. At the end of the day, you’re the driving force behind everything. No one else is going to care as much about making things happen than you. Be kind and work hard is what my mom always tells me, and I gotta say, it’s great advice. MD: Did you run into any career roadblocks? TG: My biggest roadblock in my career has been, without a doubt, myself. Self-doubt and comparing are something I’ve always struggled with, and when I started Half Baked Harvest, it only escalated. Even though it’s something I still struggle with, I’ve learned a few ways to push negative thoughts out of my head. MD: How did you overcome that? 1. No Negative Thoughts: When I begin to doubt myself, I immediately think to myself, no, stop, don’t go there, and then I try to refocus my thoughts on something positive. I know this may sound senseless, but not allowing my thoughts to sway negatively is hugely helpful. 2. Talk About It: Sometimes what I find most helpful is just talking about what I am stressing or doubting myself on. Most of the time, getting someone else’s opinion or even just having someone listen can make you feel 100 times better. 3. Find Inspiration: A lot of times when I am feeling down, I will search for inspiring quotes and spend five minutes reading through them to find the inspiration I need to keep moving forward. Sometimes reading just one inspiring quote is all I need to kick myself back into gear. MD: What are your go-to recipes when you’re in a hurry? TG: My go-to recipes when in a hurry are either a quick veggie-filled pasta, an avocado grain bowl, a stir-fry … using all the veggies left in the fridge, or some kind of loaded-up toast. Breakfast for dinner is always another great option, especially when I have these freezer-friendly whole grain waffles around. Oh, and sometimes I’ll cook up some fried eggs and serve them with whole grain toast, avocado, burrata cheese, and fresh herbs—it’s so good. Of course, pizza is always a great last-minute option as well. Just pick up some fresh dough at the store on your way home from work, and then throw on whatever toppings you have on hand. Pizza just can’t turn out bad because anything topped with cheese will almost always be delicious. MD: What food staples do you always keep on deck in the pantry? Do you have a simple list? Grains: quinoa, brown rice, white rice, polenta, farro, oats, etc. Nuts: almonds, cashews, walnut, pistachios, pecans. Seeds: hemp, chia, sesame, pepitas, etc. Nut/Seed Butters: almond, tahini, peanut, cashew. Flours: all-purpose, whole wheat, bread, pastry, bread self-rising. Cooking oils: extra-virgin olive oil, sesame, peanut, coconut oil. Canned products: coconut milk, tomatoes, pumpkin, beans, high-quality tuna. Jarred products: sun-dried tomatoes, olives, peppers. Vinegar: balsamic vinegar, apple cider vinegar, red wine vinegar. Fruit: bananas, pineapple, avocado, dates, etc. MD: What’s your favorite part about fall, both in and out of the kitchen? TG: Autumn is without a doubt my favorite season, and for so many reasons. I love the crisp air, the changing colors of the leaves, the golden-hour light, the fall clothes, apple picking, roasting pumpkin seeds, cozying up by the fire with a mug of coffee or cocoa, the Halloween planning, and of course, all the excitement for the upcoming holiday season. To me, it’s such a magical time of the year. MD: If you could only eat one meal for the rest of your life, what would it be and why? MD: And who is your dream chef to cook a meal with? Preheat the oven to 325ºF. Line a rimmed baking sheet with parchment paper. On the prepared baking sheet, toss together the oats, quinoa, nuts, coconut, pumpkin seeds, sesame seeds, and hemp seeds to combine. In a small saucepan, heat the maple syrup and coconut oil over medium. Stir in the vanilla, cinnamon, ginger, nutmeg, and salt. Pour the mixture over the oat mixture, and toss well for two to three minutes to fully combine. Spread the granola out in an even layer. Bake for 35 to 40 minutes, stirring two or three times throughout cooking until the oats smell toasted and are golden brown. Remove the granola from the oven, and let cool for five minutes. After five minutes, spray the bottom of a ﬂat one-cup measuring cup or a ﬂat-bottomed glass with cooking spray. Press the granola into the baking sheet using the bottom of the measuring cup so you have a ﬂat slab of granola. Let the granola sit for one hour to cool and harden. In a large stockpot, heat the oil over medium. When it shimmers, add the onion, and season with a pinch of salt and pepper. Cook, stirring frequently, for about five minutes until softened. Slowly add 1/3 cup of the cider, and let it cook into the onions. Repeat until all the cider has been added and the onions are caramelized (about 10 minutes total). Add the apples, squash, and thyme, and cook over medium heat, stirring, until softened (about eight minutes). Add the beer, three cups of broth, and the cayenne. Increase the heat to high, bring to a simmer, and cook for 15 to 20 minutes, or until the apples and squash are tender. Meanwhile, make the granola. In a large skillet, cook the bacon over medium heat until crisp, three to four minutes per side. Drain on a paper towel–lined plate. When it’s cool enough to handle, coarsely crumble the bacon. In the same large skillet, melt the butter over medium heat, and cook until just beginning to brown and smell toasted. Add the oats and pumpkin seeds, and cook for one more minute. Remove the skillet from the heat, and stir in the crumbled bacon. Season with salt. When the apples and squash are tender, transfer the soup to a blender, and pulse until smooth. Return the soup to the pot, and set over medium heat. Stir in the milk, and then bring the soup to a low boil. Stir in the cheddar and Brie until melted and smooth. Add more broth to thin the soup, if desired. Simmer for about five more minutes or until ready to serve. In your slow cooker, stir together the coconut milk, yogurt, tomato paste, curry paste, onion, garlic, ginger, garam masala, paprika, turmeric, cayenne, and salt until smooth. Add the chicken, and stir to coat. Add the butter. Cover and cook on high for four hours or on low for six to eight hours. I like to stir mine once or twice during cooking, but it’s not essential. Stir in the lemon juice. Taste and season with salt and black pepper as needed.